Could you tell us what is your favorite speedboard right now? Why do you like it so much? It would have to be the Carbon Art Speed 44 Mk II, sweet board to sail with an incredible wind range. The original SP 44 had boxier rails and tended to bounce around in chop, especially going upwind. The Mk II version has a more rounded rail which bites into the water better and offers incredible upwind ability as well as being more forgiving in chop. The board is so easy to trim back on the tail and fly through careful positioning of the mast foot. My sails have the draft relatively far forward and low in the sail so I had James at Carbon Art move the mast track back for me to balance the board out more. I also asked him to adjust the footstrap position to suit my stance and had the front inserts moved further back. I designed my fins to give more tail lift which suits the narrow tail of the board perfectly. With the Naish Stealth and my Curtis Roo fins it’s a potent combination with levels of performance I’ve yet to get near. About sails, you are using Naish Stealth sails. Have you got some trimming tips for other Naish speedsailors? Do you use the recommended masts? The beauty of the Stealths is the drive is very low and forward so I never feel I’ll get lifted in a gust and pitched forward, the sails just drive hard and let me concentrate on speed. At only 1.78m I don’t have the height advantage of the taller speedsailors so I need the power lower in the sail to get any advantage. I tend to use the standard lower RDM mast section for the sail but use the top section from the next shorter mast, i.e. a 430 base with a 400 top. What this does is flatten out the top of the sail and make the lower section fuller. I shim up the cams to get more of a knuckle on the leading edge and overtighten the battens to lock in the shape. I tend to use less downhaul than recommended to keep the leech a bit tighter for more overall drive from the sail and set the outhaul neutral to negative to get the most power out of a given sail size. Setting the sail up this way I never need an adjustable outhaul, the Stealth stays super stable even when way overpowered. I position the mastfoot so the board is just starting to fly when fully powered up, small changes to the boom height let me trim out the angle of attack, lower in chop so the board doesn’t fly and higher in flat water for minimum wetted surface area. 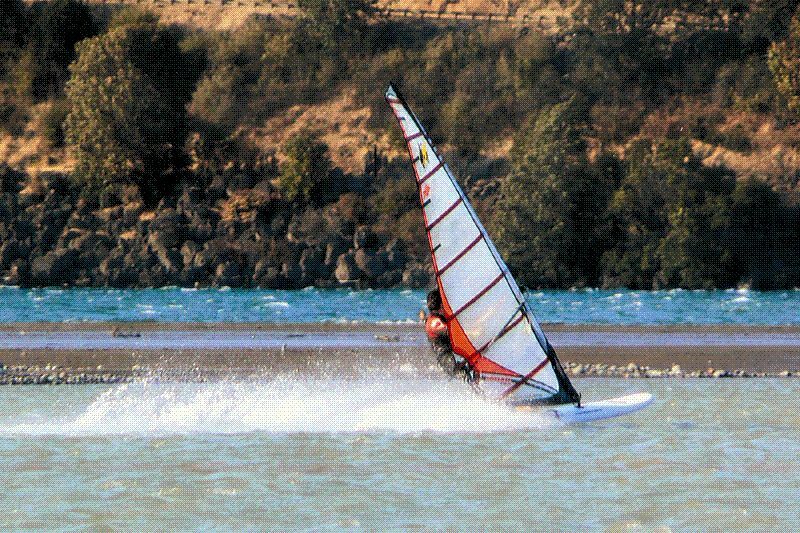 What kind of fins are you using for speedsurfing? Do you have a fin capable of sailing near or over 50 knots? I’ve been using Curtis Fins for over 20 years now; I started when I was involved with Gaastra and the ADTR project back in the late 1980’s. We were developing the sails Pascal Maka used to break Crossbow’s outright speed record and Curtis Hesselgrave got involved making fins for the record attempt. I developed them for use in the World Cup and got all the top riders using them. We did a lot of development work together and I helped him grow his company. I stepped away from the industry in 1993 and joined back up with him when I returned to windsurfing in 2004. We’ve been developing the speed fins for the last few years and Curtis still builds them by hand for me. The foil section we’re using was developed from some old Skunkworks research Lockheed did a few years ago. It has a cavitation inception speed around 53 knots and we’ve combined it with the old Spitfire elliptical planform which has the lowest induced drag of any planform; we used it back in the early 1990’s on slalom fins for the World Cup. Recently Curtis has built some fins for the kiters to use, with the foil section we developed, and they’ve run nearly 60 knots on the fins. At the moment we’re just scratching the service of these fins potential in speedsailing so I’m pretty confident I can trust them to go faster than 45 knots, my current top speed. 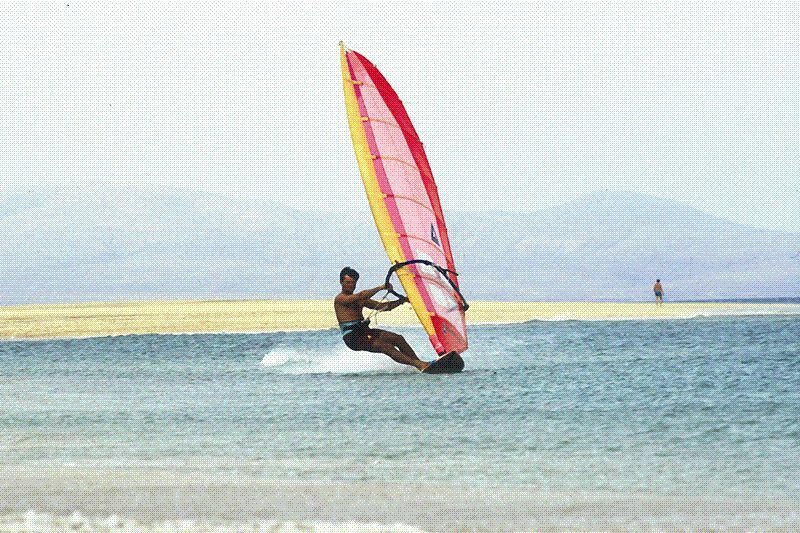 Could you tell us about speedsurfing at your place, is it big or increasing? Do you guys use the same gear or all different gear? Speedsailing in the USA developed differently to what happened overseas. Back in the late 1980’s the US Boardsailing Association and Ken Winner (ex World Champion and World Cup racer) realised 500m records in the US were impossible as there were no locations with a course that length. They developed 100m as the US standard and USBA ratified them for US records. In total 1100 speed sailors registered 100m speeds. The fastest course in the USA was in the Columbia River Gorge where the Klickitat River meets the Columbia River. In 1993 the US record of 44.49 knots was set here. In 1996 the course was washed away in devastating floods and speeds sailing went into decline. The advent of GPS has rekindled the sport, this is still the fastest area in the USA, I’ve won the North American KA Challenge with speeds registered here in the Gorge for the last three years. The most we get out at any one time is about a dozen sailors, unfortunately GPS receivers and analysing the data is still too complicated for most windsurfers. Hopefully this year we can simplify things, we are working on uploading tracks to the internet for analysis and automatic posting to a US website tailored for windsurfers here. It will automatically calculate the 100 m speed and post it to a US ranking site so speedsailors can compare themselves to other US sailors and also look at the tracks via Google and download them for their own analysis. The key to growing the sport here is making it simple so anyone can participate. On the beach you’ll find gear from most of the major manufacturers. What’s fast in the rest of the world is fast here, Carbon Art speed boards and Naish Sails have posted the fastest speeds here for the past three years. From www.gps-speedsurfing.com I have seen you know a few things about GPS. Could you tell us is it possible to do exact measurements on a windsurfer with our current NAVI GT-31? The biggest problem we have with accurate speeds is our terms of reference, i.e. we are trying to measure two dimensional speeds with an instrument that measures three dimensional velocities. Speed is a scalar measurement whereas velocity is a vector measurement having both direction and speed. When you convert from one to another you lose accuracy and that leads to having to use mathematics and statistics to estimate our true speed. With the GT-31 and GT-11 we lose accuracy when the gps chipset converts from 3d to 2d speed. To get better accuracy out of the units we need to capture the raw binary data and do the calculations with a more powerful stand alone computer. It’s possible and would result in a greater certainty of what our actual velocity is. We still have the problem of knowing exactly where we achieved the speed as the single frequency gps chips don’t output the necessary data we need to post process and correct the positional data. To my thinking we could quite easily improve our accuracy if we used more of the accuracy estimates the gps outputs in binary mode and combine this with the 3d velocity and 3d positional data for post processing. HDOP does that mean? What should it be according to your findings? Horizontal Dilution Of Precision, it is an estimation of the accuracy of the gps calculations to determine position using the Pseudorange data from the satellites it has taken fixes from. Any HDOP higher than 4 and the integrity of the data is called into question. Generally the more satellites you can get fixes from the lower the HDOP will be, i.e. the estimated error factor of how far you are away from the actual position. Any HDOP lower than 1 means there is a high probability you are where the gps says you are, the best I have seen in testing is 0.6 with 12 satellites used for the calculation. When you are measuring velocity using doppler derived calculations HDOP provides no idea of the accuracy of the velocity, however the gps does output an estimate for the 3D Velocity accuracy (VACC 3D). The VACC 3D is what we should be focusing on. Combine this with the 3D Position accuracy estimate (PACC 3D) and you start to form a very accurate picture of exactly where you are when you achieved your speed. It wasn’t my fastest session but for sheer pleasure and exhilaration it couldn’t be beat. Back in 1988 I had been in Sotavento for a month testing equipment and training for speed events. We had waited weeks for perfect conditions and one evening about 2 hours before sunset it switched on and lit the place up. Buttery smooth water, perfect wind direction and ideal tide. Michael Pucher was with me and we went at it until sunset, no timing gear just 2 speedsailors pushing themselves to the edge of the speed envelope. I was on a Gaastra Speedfoil 4.3 and 15” wide Jimmy Lewis Mudshark with a Curtis fin (I’ve still got the fin!). Uli Stanciu from Surf Magazin was shooting photos for the mag from some ladders we had set up in the water. With each run we got faster and faster, Michael initially had the edge but some tuning soon saw us draw closer. I had a new set of speed sails we’d tested on the ADTR and wanted to see how the results correlated with on water feel and performance so I had a good idea of the speed potential of the sails. I’m pretty sure we were close to 40 knots that day (Erik Beale had yet to break the 40 knot barrier) but unlike today where GPS gives us a good idea of how fast we’re going there was no way of measuring back then. What conditions do you think we need to take the world record back? Unfortunately I doubt windsurfers will ever take back the record, both kites and boats have gone over 50 knots for 500m but we are over a knot behind. The biggest problem is finding a course long enough and windy enough to make a realistic attempt on the record, as yet no one has found one. The canal in France is very much dependant on wind direction and is currently closed, Sandy Point in Australia is getting shorter every year as the sand dunes get bigger and block the wind, the Ray in England doesn’t have consistent winds and is a tidal location with a narrow window of opportunity; essentially we’ve run out of locations you can rely on for the conditions we need to break the record. When the GPS came along everyone thought we’d find all these amazing locations where the record could be broken and the GPS would give us a chance to try them out. In reality only 2 new courses were discovered, ARooBar in the USA and the Brace in Holland. Some good speeds have come out of them but nowhere near record speeds. Most speedsailors stayed in their own backyard, the days of speed quests to the far flung reaches of the earth never materialized. Kiters went in search of the perfect location for their needs and settled on Luderitz Bay in Namibia, ultimately breaking the record. Windsurfers are still searching but the passion seems to be waning as each year passes and we can’t find the ideal spot; all the political wrangling over the GPS and records hasn’t helped either. What’s needed is a gently curving beach about 5 km long, a flat upwind area and a clean wind driven over 100’s of miles that is cold, smooth and steady. As the wind direction changes you can move further along the beach to get the optimal direction as well as having a gradual run in to the course to build up momentum. The curving course will also block a lot of following chop that gets critical when you’re blasting along at 50 knots. There’s one place I think may have the potential, Playa de Fuego, it’s about 15 km long, and is situated in one of the windiest locations on the planet, but it lies at the bottom of the earth and will take a mission next winter to try it out. Fortunately there is an international airport 50 km away that keeps accurate wind records so I know the best time to visit. It will be interesting to see if it turns out to be the Shangri La of speedsailing. Thank you Roo for this interview!